. Furniture Medic by MB Restoration . . Formely Beim4 Furniture Restoration. . . . . We Refurbish your Furniture Treasures . . Everything Wood! . .
* * Salem, Nashville, Greenville, Carterville, Carlyle, and All Towns in between. . Repairing . Enhancing . Refinishing . My name is Mark - I Refurbish Everything Wood - I enjoy it. . Cell: 618-246-6146. 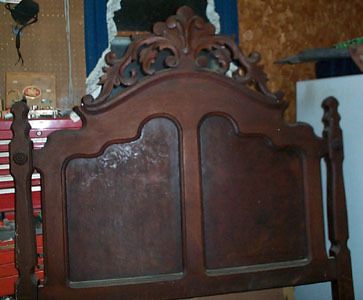 Here is an old Walnut Bed that I refinished. So they usually need at least some repair, and thats ok. 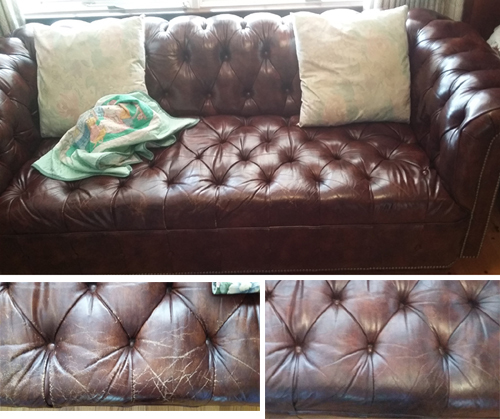 I enjoy the old furniture and I've been doing this for my customers and myself over 25 years! 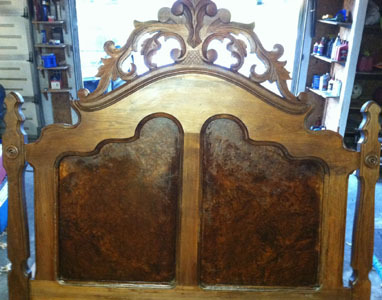 Here is the Walnut Bed during restoration. You can begin to see the grain in the walnut. at its' home in Nashville, Illinois. Actually I like 'all' the old stuff. From toys to bottles to furniture to cars. as you load it on the truck. 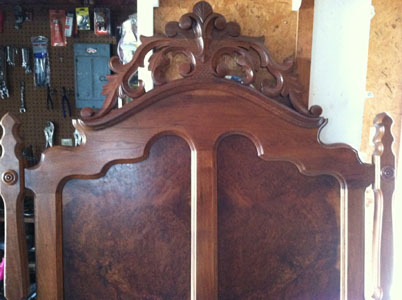 or restore the antique bed you already have. 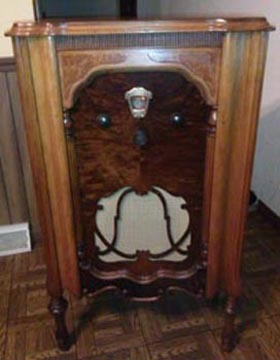 Here is a Lincoln Rocker that had been through many transitory repairs. I pulled over 100 nails out of this rocker. were probably over 50 years old themselves! Notice the wires holding the runners to the legs. And the wire holding the rear legs together. The split-out wood on the front of the right runner. back vertical rails was splitting. The pictures tell the stories. But Just Look at Her Now! The rocker turned out beautiful. This belonged to my client's Grandparents. 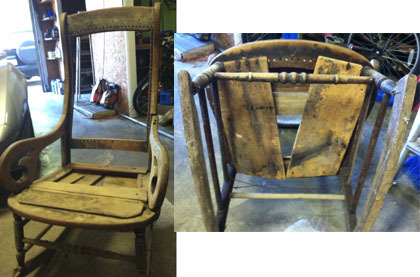 willing to have the old rocker restored. She was in my garage one day during restoration. pieces kind of made her nervous. Lol. can see how she turned out. Not bad for an original Lincoln Era rocker. 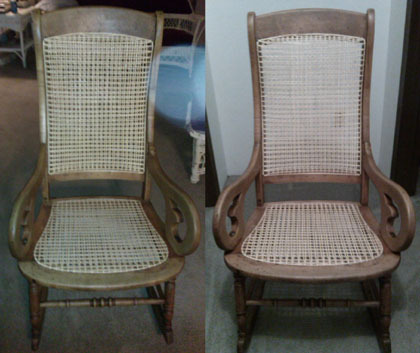 family heirlooms kept and restored. 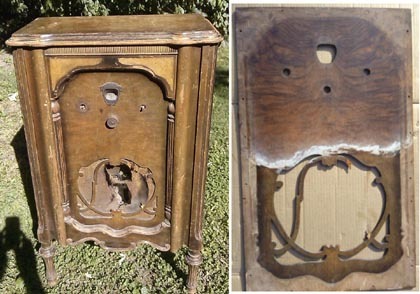 The old finish was difficult to remove. Hiding below that finish was walnut. New Baden, Pinckneyville, Du Quoin - - and All Towns in between, Large and Small. She was very happy with the results. If you would like to visit our Facebook page please: Click Facebook Here.